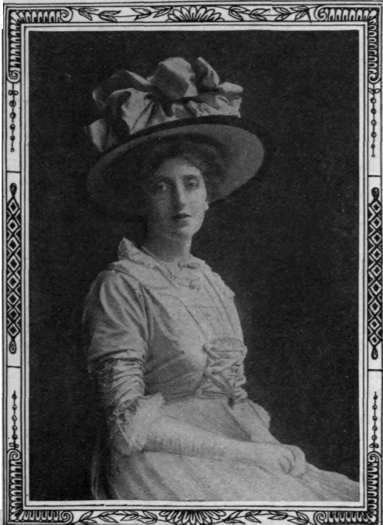 While insisting that the elite should not control such lists of invitations, however, Lady Dudley has not been forced to take the drastic step of her predecessor, Lady Northcote, who caused no small sensation when, shortly after Lord Northcote became Governor-general in 1904, she struck off her list of guests the names of several smart colonial girls whose deportment had offended herself and her husband at the Government House festivities. As the viceregal circle is to colonial society what the Court is to British, this, of course, meant social ostracism. But it was agreed at the time that Lady Northcote was quite justified in her strong action. This incident recalls an amusing story told of Lord Beauchamp, when, in 1899, he became Governor-general of New South Wales, in which colony he was noted, amongst other things, for the exclusiveness of his official entertainments. The story goes that for one function he issued tickets of different colours - blue ones for the more important guests, and yellow for those who stood lower in the social scale. By some error a certain dignitary and his wife got cards of different colours, and on arriving at Government House were requested to enter by different doors. The lady's anger rose, and she paralysed the flunkey by exclaiming: "I'll let them see that my husband and I are not a seidlitz-powder !" There are many official functions-dinners, balls, dances, concerts, "at homes," and garden parties, held at Government House, and on account of the limited accommodation of the rooms only a certain number of invitations are issued for each function, in order to prevent overcrowding. Beginning at 9 p.m., the viceregal dances and concerts usually terminate shortly before midnight. Gorgeous toilettes at these functions are usually conspicuous by their absence, and, with the exception of diamonds, little jewellery is worn. . Australian women seem to care little for display, and a low-cut dress is the exception rather than the rule. Invitations to the garden parties are issued on a more liberal scale, and sometimes as many as fifteen hundred people attend these functions. Music is provided by military bands, and refreshments, including cold chicken and ham, strawberries and cream, and champagne, are supplied on a most liberal scale. The expense of these entertainments is considerable. On one occasion the guests consumed several hundredweight of strawberries and many gallons of cream. The grounds of Government House are some forty acres in extent, and are exceedingly beautiful. From a balcony adjoining the private apartments of Government House a splendid panoramic view of Sydney Harbour and the surrounding country is obtained. Indeed, the beautifully laid out gardens and shrubberies extend almost to the waters of the harbour. A curious custom is observed, by the way, in the ball-room. In a recess on one side is a dais and a throne like chair, the latter being symbolic of the British throne. This chair is never used, even by the Governor. On January 1, i9oi, the inauguration of the Commonwealth took place at Sydney, a message from Queen Victoria being read to the people of Australia by the first Governor-general, the late Earl of Hopetoun, subsequently created Marquess of Linlithgow. And it may be remembered that in May of that year King George and Queen Mary visited Australia and declared Parliament opened at Melbourne. There were gay doings in Sydney during that year. No less than £150,000 was spent on processions, banquets, and entertainments to mark the inauguration of this new era in Australian history, and nothing could have exceeded the enthusiasm with which the multitude welcomed Lord Hopetoun and his wife. The following incident added not a little to their popularity. The wife of a colonial became the mother of triplets. The husband applied to the Governor for the Queen's bounty. Lord Hopetoun replied that the Queen's bounty did not extend to the Colonies, but that he had much pleasure in sending a cheque for three guineas from himself and his wife, " with best wishes for the health of the mother and little ones." Photo Themaer land, Lady Hopetoun shot a very fine buck. This drew attention to her skill with the rifle, and a few days later she made some fine hits at a rifle-range. On marking the bull's-eye, an enthusiastic bystander amused the spectators by exclaiming loudly: " Isn't she a nailer ! " On another occasion, during an extensive tour on horseback through the north-west of Victoria, Lord and Lady Hopetoun, mud-covered and generally dishevelled, rode into a town where the principal residents were waiting to present an address of welcome. After a few minutes his lordship ventured to ask for what they were waiting. "We're waiting for the Governor and his wife," said the spokesman of the party. " Well, I am the Governor, and this is Lady Hopetoun," his lordship replied. His remark, however, was greeted with incredulous laughter, and it was only when their friends overtook them that the Governor was able to convince the unbelieving residents of their identity.